I recently read Rework, the book written by Jason Fried and David Heinemeier Hansson, the owners of the company 37signals. It throws a lot of conventional wisdom about business out the window, and embraces that scrappy, “get things done” attitude that I admire. One important idea in the book is to “sell your by-products.” I loved this chapter and, if you have a new or growing business, is a critical principle to leveraging the most out of your business. The basic idea is this: every business has a by-product, and one can leverage these into sellable items. 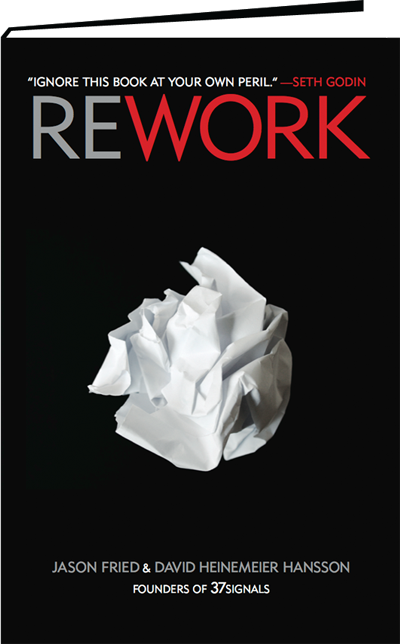 In fact, Rework itself is a by-product from the authors’ experience in running their company, 37 Signals. During my tenure at Box Office Mojo, we took a similar approach. We looked at things we did on a routine basis in our existing workflow to find new and innovative ways to get the most out of them. One small example was our process of updating rating movie information. We would enter the MPAA every week for movies they recently gave ratings to. But rather input the information so it would be viewable on the movie pages themselves, we automated our database to record the date the rating was issued. From that, we were able to create a page that showed the latest ratings issued by the MPAA. With just a few hours of one-time upfront development work, we were leveraging our process of entering ratings into a news item we could promote to our readers on a weekly basis. It required no additional time in our regular workflow, and was an additional item we could “sell” to our readers (more pages views via a regular news item). We applied this same idea to release date changes, movie title changes and slew of other areas in our business. Granted these are fairly minor examples, but if you’re looking at ways to improve the bottom line, take a look at your existing processes and see if there’s anything that you’re currently doing that you can leverage into a sellable product with little or no extra overhead. Even small by-products can add up to significantly increase your profits without impacting your existing operating costs.